So it is Liverpool who will end 2014 on a high. They have struggled this season but, if they can repeat that display more often, a top-four finish may still not be out of the question. Anyway that is all from us. Join us again on New Year's Day for a full Premier League schedule. Thanks for your company. Cheerio. "It was a great performance against a very good side. I felt for the big part of the game we dominated. We gave away a poor goal and it goes to 2-1 and they almost score again straight after so that is a frustration. But apart from that spell the work-rate was outstanding and we were really exciting going forward. "For me it was about getting back to performing well and getting ideas that will help the players play how we want to play. Tonight we were convincing. We have to keep that intensity and work-rate. "Every team at this level is a difficult game. We know the work we need to put in but the players are starting to work together. We are a young side looking to settle in and play a type of football we find creative and exciting." Liverpool striker Daniel Sturridge on Twitter: Just finished watching the game. I can't wait to be back playing in that team and scoring goals!! Top class performance from them. Swansea boss Garry Monk: "I think we played OK. We had the most possession, we created chances, but the mistakes we made cost us the game. You get punished at this level. We performed OK but those mistakes cost us. "Lukasz Fabiasnki has been fantastic this season but every player makes a mistake. You lose as a collective. "I haven't seen the situation with Jonjo Shelvey so I can't comment." Talk about all over the place. Adam Lallana may have been playing centrally but that didn't stop him from roaming both sides of the field in an impressive individual display, as shown in his touch map above. His best display for Liverpool perhaps? "One thing you get from Sterling, when Liverpool win the ball back he looks to run off the back of defenders. Where as Balotelli comes towards the ball and it limits the space." Ada: If Liverpool finish as strong as last season we will land Champions League again. 15 wins from last 18 games last season. Alicia: Now THIS is progress! Shades of season 2013/14, brought a tear to my eye! Lallana, Coutinho and Henderson on fire! WE GO AGAIN! John Roberts: Hoping Rodgers will get some credit for that - under pressure, with injuries, but seems to have found a formation that works. Newcastle manager Alan Pardew has tonight been given permission to talk to Crystal Palace after compensation has been agreed. It's all over at Craven Cottage as managerless Brighton win 2-0 at Fulham. The victory moves them out of the relegation zone. 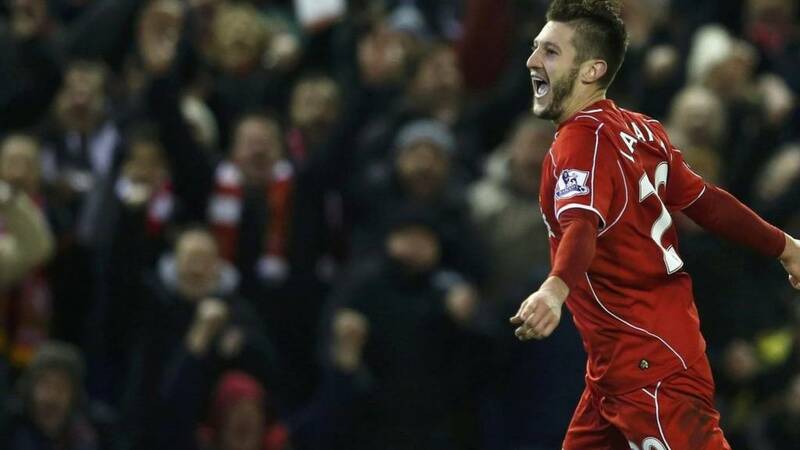 Liverpool midfielder Adam Lallana on Sky Sports: "I thought the lads were brilliant. I have always said it wasn't going to be easy making the move from Southampton but the lads have been great. I have been playing more central and have been really enjoying it. It was great to get the goals and more important was the performance. "We haven't put in many good performances this season and hopefully we have turned the corner. The pressure is always different coming to a team like this. Possibly how well Liverpool did, the expectation came as a bit of a shock to a lot of the new signings. But we are bedding in with time. There is more gelling coming as a team. Our target is top four." A dominant second-half display from a fluent Liverpool. They had 21 shots on goal, 11 of which were on target, and could have been celebrating an even more impressive victory. Swansea had 11 shots themselves but defensively they were pretty awful. That win moves Liverpool into eighth in the Premier League as they jump above Swansea on goals scored. An encouraging end to 2014 for the Reds. "Lallana was outstanding tonight along with Coutinho, Sterling has been a bit subdued but that front three looks formidable. Behind them, the midfield was strong, and all this without Steven Gerrard." It looks like Championship strugglers Brighton are set for a priceless win as Solly March makes it 2-0 at Fulham. Into injury time. One defeat in 10 matches now in all competitions for Liverpool as they make it back-to-back wins in the Premier League. Impressive stuff. Inches away from a consolation by Bafetimbi Gomis as his shot just flies past the far post. "From what Rodgers has said they'll play this way for the foreseeable future. All I would say, at the start of the half, they looked a bit shaky. Can they do this against the big sides? They did well against Arsenal but can they compete with Chelsea, Manchester City and Manchester United? Today it's been really good from Liverpool, especially without the ball. They're back to where they were at last season, closing teams down in packs." Three minutes of added on time signalled. Mario Balotelli close to his first Premier League goal for Liverpool but, after a neat one-two with Philippe Coutinho, his low shot is kept out by Lukasz Fabianski. At the other end Wayne Routledge shoots over the bar from outside the penalty area. Lovely stuff from Liverpool. Alberto Moreno does well down the left. He passes to the impressive Philippe Coutinho who, after a couple of tricks, lays the ball back to Jordan Henderson 20 yards out. His shot is dragged wide though. A little over five minutes to play at Craven Cottage, where Brighton still lead Fulham 1-0. All over in League One, where Leyton Orient have won 3-0 at Yeovil to move out of the relegation zone. "It's a good opportunity for Mario Balotelli, here's his chance to get a Premier League goal. There's been a lot of talk ahead of the transfer window but Rodgers has said he's staying but you feel as though his performances have to improve ahead of the summer window as well." Almost a grain of hope for Swansea. Substitute Bafetimbi Gomes sees a slightly deflected curling effort cannon of the bar with goalkeeper Simon Mignolet beaten. "It's just gone flat from Swansea's point of view. They're struggling to get in round the back and you just wonder if it is damage limitation for them now." And sure enough Raheem Sterling is the man to make way for Mario Balotelli. Raheem Sterling is lucky there. Federico Fernandez seems to have annoyed him and the Liverpool man throws his hand in the direction of the Swansea defender's face. It certainly wasn't a punch, a slap maybe, but you can't do that these days. He has got away with it though as the game goes on. Mario Balotelli is getting stripped and ready to come on. And still Liverpool come forward. Philippe Coutinho blazes over from 20 yards. "Lallana can be happy with tonight, he's really starting to gain confidence and is beginning to look like a Liverpool player." Adam Lallana gets a standing ovation as he is replaced by Lazar Markovic. The midfielder hasn't had it all his own way since moving to Anfield from Southampton in the summer but he showed in that second-half cameo how good he can be. Game, set and match for Leyton Orient at Yeovil, where Orient lead 3-0 thanks to Dean Cox's 50th goal for the club. Into stoppage time at Huish Park. Raheem Sterling looks desperate for a goal this evening. The makeshift striker runs 20 yards with the ball before having a slow shot held by Lukasz Fabianski at his near post. "Liverpool had that spark at the turn of the year, last season, and they blew teams away. They've had a few shaky moments in this match but they're returning to that style of play." Swansea are looking pretty sorry for themselves at the moment. Top scorer Wilfried Bony has long since departed and you can only see the hosts adding to their lead. It could be a long 17 minutes for the visitors. "It was a decent ball, a driven cross which Liverpool have been using throughout this game. Shelvey was actually too concerned about fighting with Lallana and he's put it in his own net. It's a nightmare at the Kop end." No surprise as a rampant Liverpool add to their lead. A slice of luck again though as Jordan Henderson's right-wing corner is flicked into his own net by Jonjo Shelvey. KoloKK: Is this the point where the season starts for Rodgers' team? He's set the team up very well tonight. Joe Young: So this is what it feels like to enjoy watching Liverpool again? This game looks to have plenty more goals in it yet. An inspired Adam Lallana sends Raheem Sterling through on goal, and he beats goalkeeper Lukasz Fabianski, but can only find the side netting from a tight angle. The Anfield crowd are singing Lallana's name and it is no wonder. He has been pretty special this half. No manager, no problem for Brighton. The Seagulls lead Fulham 1-0 at Craven Cottage as Adrián Colunga beats Marcus Bettinelli from the penalty spot following Kostas Stafylidis's foul on Craig Mackail-.Smith. "What a wonderful goal. Lallana composed himself down the left hand side and composure at the end of it to put the ball past Fabianski. He's just coming into a run of form but can he be consistent now until the end of the season? We know he's capable of it." His first goal may have been lucky, but his second is sublime. Philippe Coutinho's deft flick sends Adam Lallana through the midfield. He cuts inside a couple of defenders before striking low into the net with his left foot. Now Adam Lallana has a low shot from 20 yards saved by Lukasz Fabianski. You feel as though there could be a goal with every attack at the moment. A sloppy pass from Jonjo Shelvey sees Philippe Coutinho break with Liverpool two on one. His pass to Raheem Sterling is well timed but the England man hesitates and the chance is lost. Swansea are suddenly looking far more dangerous as an attacking force. Defensively, they look all over the place though, which surely equals more goals to come. This could be a fun last 30 minutes. Goals all over the place at the moment. Both Leyton Orient and Yeovil began the day in the League One relegation zone, but as things stand Orient are heading out of it after Kevin Lisbie pounces from close range to give them a 2-0 lead at Huish Park. "It's a much better tempo in this second-half now from both sides. Swansea started the first-half much better but for the goalkeeper's error. Credit to them for getting back in to it with the goal." So close to 3-1 for Liverpool as Raheem Sterling sees his shot from the left side of the penalty area hit the post. Just seconds earlier, Wilfried Bony has a low shot well saved by Simon Mignolet. This game has come to life. "He closed down Fabianski well, he looked a little uncertain but the keeper should do better. Credit to Lallana who gets his body in the way. Fabianski's trying to be too clever and play it out from the back but he's been dealt a blow. "It's a disaster, they started this second-half on the front foot but for your keeper to make that error is not good." Swansea aren't done yet though as Gylfi Sigurdsson converts from close range after Wilfried Bony and Mamadou Sakho challenge for Wayne Routledge's cross. That is one for the 2014 goalkeeping bloopers showreel - but it's not Simon Mignolet this time. Lukasz Fabiasnki takes an age on the ball after a back pass. His clearance smacks into the onrushing Adam Lallana and bounces over him and into the net. What a fluke. "Well I can see straight away, Swansea are not letting Liverpool come out of defence with the ball. In the first-half it was far too easy for Liverpool to move out with possession. They're not just closing down the back three but Lucas too. " Liverpool start the half on top as Philippe Coutinho and Adam Lallana buzz around behind lone striker Raheem Sterling. Still too many loose passes from both sides though. At the other end Martin Skrtel is booked for pulling back Wayne Routledge and he misses the New Year's Day game against Leicester. He can have few complaints with Routledge needing to replace his shorts after having them ripped. The more offensive Angel Rangel replaces Jazz Richards at right back for Swansea. Looks like the visitors are going to go for it. Chelsea Warrior: I enjoyed that half from Liverpool. Full of 100mph-kamikaze style forays. Are they back? Corner turned? Next 45 will tell. Liverpool have done most of their attacking down the left in the first half with Philippe Coutinho (43) and Alberto Mourinho (45) the players with the most touches for the home side. Perhaps not a great surprise but Liverpool are the club with most goals by Spanish players in the Premier League with 144 goals. Arsenal are next with 87, followed by Chelsea on 54, Man City on 45 and Swansea with 31. The half-time whistle goes at Craven Cottage. Not a thriller in west London, where Fulham and Brighton are still locked at 0-0. Back under way at Huish Park, where Leyton Orient lead Yeovil 1-0. Should Pardew stay or go? With Newcastle and Crystal Palace in talks about Alan Pardew's future, we've been asking whether he should leave St James' Park for Selhurst Park or stay where he is. And judging by your responses, Pardew might have a difficult decision to make, with 51.8% saying he should stay, and 48.2% saying he should make the move south. Surprisingly, the stats suggest Swansea have had more of the ball but, with just one shot on target, it is pretty clear who is on top. Liverpool's six shots on target from eight attempts isn't a bad ratio. "Bony is key for Swansea, he can score so many types of goals. He can score tap ins, long range efforts or headers so he's so important for the away side." Swansea can have few complaints at going in behind at the break. Liverpool have been the better side, even if they have created fairly little. At the other end, Philippe Coutinho's swerving 20-yard strike is beaten away by goalkeeper Lukasz Fabianski. Still no goals in the evening's only Championship match, though Hugo Rodallega has just gone close to making the breakthrough for Fulham against Brighton at Craven Cottage, where they are approaching half-time. 0-0 in that one. Leyton Orient lead 1-0 at Yeovil at the break in League One. Gylfi Sigurdsson's right-footed delivery causes a bit of panic inside the Liverpool box but Simon Mignolet is eventually able to come and collect after a bit of pin ball inside the penalty area. Wayne Routledge has found some space on the left for Swansea this half but, again, his deep cross misses its intended target. Swansea looking fairly toothless so far. Shohidur Rahman: Idiotic from Shelvey and should've been sent off. Dwain_44: Shelvey elbow on Can. Say hello to your 3 match ban. Ashley Wilkinson: That's shocking from Shelvey. But how are the referees, three yards away, missing these? Marriner missing another big call. Jonjo Shelvey shows good feet as he waltzes past two Liverpool defenders on the edge of the penalty area. As the ball gets away from him, Emre Can goes down holding his face as the former Liverpool midfielder's arm smashes into his face. Perhaps not the last we have heard of that incident. That looks naughty from Shelvey. Ryan Cowie: This is the Liverpool of 2013/14 on show tonight - pace, creativity, commitment...let's just hope the defence holds. "It was a wonderfully worked goal from Liverpool. They haven't created an awful lot but that was a telling moment. "Nobody was tracking the run of Moreno who started the move, Swansea had numbers back in the six yard box and should have dealt with the cross." Close to a second for Liverpool after some trickery from Philippe Coutinho. The midfielder twists and turns, leaving Jazz Richards on the floor, but his near post shot is turned wide by Lukasz Fabianski. Relief for Liverpool as Alberto Moreno scores his first Anfield goal. He started the move with a pass to Adam Lallana, who in turn slipped Jordan Henderson into space on the left. The midfielder's low cross is smashed into the net from close range by the onrushing Moreno. Good move. "They heavily watered the pitch before the match which suites Liverpool's style of play as it helps them playing through the lines. It seems to me Swansea have just struggled to deal with the it." Better from Swansea. Wayne Routledge's deep cross from the left is met by the diminutive Nathan Dyer but his header is all too easy for Simon Mignolet. Not really the man you want on the end of a looping cross. Swansea will be growing increasingly confident as this match goes on. Liverpool may be enjoying most of the possession but they are doing very little with it. If the Swans could be a little more composed on the ball, they could have real joy this evening. Not much happening. "That's better from Swansea, they need to make 10, 15 passes. It allows them to get more of a foothold in the game as they've struggled to string a few passes up to now." We have our first goal of the evening and it's come in League One, where Chris Dagnall's back-post header gives Leyton Orient a 1-0 lead at Yeovil. Big game at the bottom of League One this one. Five minutes to go to half-time at Huish Park. How Liverpool miss the presence of Daniel Sturridge in attack. For all their neat and tidy possession, they are yet to really hurt Swansea. It all looks a little bit lightweight where it matters. "I think Liverpool are much better today, from what I've seen, without possession. When they win the ball they're looking to break. They seem to be returning to that high tempo football." A first real attack of the match for Swansea but, after a promising period of possession, Wayne Routledge's left-wing cross is horribly overhit and lands in the stand behind the goal. Voting closes at 20:30 GMT. A tough start for Swansea striker Wilfried Bony. As you can see from his touch map above, he hasn't even come close to getting near Liverpool's goal yet. The Swans are being dominated. It is all Liverpool. This time Philippe Coutinho shoots weakly at Lukasz Fabiasnki from 12 yards as Liverpool camp themselves in Swansea's half. Phil Jenkins: Easy transfer window for Liverpool. Begovic and Bony. Both proven Premier League quality and will help Reds into the top four. Nic Billot: Like the look of this Liverpool team - good balance of solidity at the back and creativity up top. Expecting a 3-1 win. "Two big chances, Lallana should score and he knows it as well. It was a great ball played in and Sterling hits a good effort but when it fell to Lallana, the position he's in, he should be scoring." A couple of chances within a few seconds for Liverpool. Alberto Moreno's cross from the left is hit goalwards by Raheem Sterling from inside the penalty area. Lukasz Fabianski can only parry the ball out in front of him but Adam Lallana scoops the loose ball over the bar. Encouraging signs for the hosts. Adam Lallana pulls the ball back from the left but it is behind everyone waiting in the penalty area. The Kop roars in anticipation as the Reds come forward again. Swansea yet to get a grip of the game in the early stages. Liverpool have started brightly as they patiently pass the ball around. No final product yet though. "I've noticed this season the atmosphere at the start of games has been completely different to the atmosphere last season. This year it is very subdued and Swansea can take advantage of that." First real chance of the match falls to Liverpool as Martin Skrtel meets a deep corner with a towering header but the ball is straight at Swansea goalkeeper Lukasz Fabianski. Looks like Liverpool are playing three at the back with Emre Can on the right of the central trio. A cagey start. The traditional 'You'll Never Walk Alone' is sung loud and proud by the home fans. Swansea's players huddle togther as they focus on their task. They will fancy this. Forget the countdown to Christmas, here comes the crossing off the days that matter to most football fans - yes the opening of the January transfer window. You get the feeling the next month will prove crucial for both the clubs in action but for very different reasons. For Swansea, it is all about keeping hold of top scorer Wilfried Bony, while for the Reds they need to decide whether to keep faith with Mario Balotelli or move for another striker. You can read BBC Sport's assessment of who could be off where in January here. Can Liverpool make it two wins in six? The teams are out at Anfield. The home fans sound expectant - as ever - but they really need a result. defeat at Chelsea on this date last year, the Reds were only in fifth in the Premier League and a place behind their neighbours Everton. They responded with 15 wins from 19 league games to finish runners-up after almost snatching the title. Brendan Rodgers' men may be 11 points worse off now compared to how they finished 2013 but a similar run would surely put them back among the top four? How did Lawro get on against Unbroken star Jack O'Connell in predicting yesterday's Premier League matches? It will be the master v the apprentice in the two dug outs at Anfield this evening - although at the moment it is the apprentice who is coming out on top. When Brendan Rodgers' Swansea won promotion to the Premier League in May 2011, Garry Monk captained the side. Now - approaching 12 months as manager of the Welsh side - Monk has taken the Swans to eighth in the table and just five points off the top five. They have bounced back from successive defeats with back-to-back wins and could yet finish the year in sixth. Liverpool manager Brendan Rodgers on Sky Sports: "The beauty of Emre Can is that he can play in a number of positions. He is a player we brought in because he is multi-functional and can play many roles very well. "The wide area is one where you need energy and speed and the players we have had playing there have been doing so for a few weeks. The players who come in have a chance now. We need to continue with the momentum we have and if we win tonight we can close the gap on the top four. "I am sure it will be tight tonight. We had a battling performance against Burnley and I'm sure we can build on that." It hasn't been the best of years for the Championship's bottom club Blackpool has it? apologised "unreservedly" for abusive texts he sent to a supporter, and now the club are in the headlines for the wrong reasons again. Blackpool's on-loan midfielder Jacob Murphy, 19, uploaded an image of himself with Tangerines team-mate Donervon Daniels with the caption "We are going to lose... Again" before Sunday's game with Rotherham. He has since apologised. Not a great way to endear yourself with a club. Perhaps time to return to Norwich? How important is Wilfried Bony to Swansea City? Very is the easy answer. rejected by Liverpool in 2007 after two weeks on trial with Rafa Bentiez's Reds. His £12m move to Wales in 2013 doesn't look bad business now does it? You can red the rest of Phil McNulty's Premier League mid-season report here. shaunyshaun: Brave decision to drop Gerrard but on form not surprising. Opportunity for the team to step up in captain's absence. dropped "indefinitely" just a fortnight ago, after a series of poor performances. But now, with deputy Brad Jones out with a thigh injury, the Reds' £9m Belgian will get another chance tonight. Perhaps one of his last with the January window about to open? January is FA Cup month on the BBC, with daily content on TV, radio and online to cover one of the world's most famous club knockout competitions. FA Cup's 50 Greatest Moments on BBC Three on New Years Eve (21:00). Former England captain Rio Ferdinand and Helen Skelton present the programme with FA Cup heroes, singers and comedians looking back at the most celebrated, most shocking, most memorable moments from the greatest domestic cup competition in the world. Reds donning those white suits before their 1996 final defeat to Manchester United. Also connected to the Palace managerial search, Frank de Boer will not leave Ajax this season according to his agent Guido Albers. With speculation linking Alan Pardew to the vacant manager's role at Selhurst Park, there have been reports De Boer is in line to be the next Newcastle United boss. "Frank will never leave in the middle of the season," Albers told BBC Sport. "But after the season is over? Anything is possible." "Lots of clubs have approached Frank in the past but he has always insisted that he would not leave Ajax before the end of the season." "When Brendan Rodgers' Swansea won promotion to the Premier League in May 2011 a certain Garry Monk captained the side. Who would have thought Rodgers and Monk would be in opposing dugouts at Anfield three years later with the former captain three points ahead of his old boss in the Premier League table? "Liverpool have only won three games at Anfield this season, but have now got back-to-back home games and their next four league matches (Swansea, Leicester, Sunderland and Aston Villa) all look winnable. Rodgers is still talking about Liverpool getting into the top four this season - if they want to do that these are the games they need to win. "Swansea meanwhile have bounced back from successive defeats with back-to-back wins and have one of 2014's most in-form strikers in Wilfried Bony." Geoff Thomas, a former Palace team-mate of Pardew, told BBC Radio 5 live: "Somebody like Alan coming in, who's got history with the club, I would imagine a majority of Palace fans would welcome him and that will give him a good start. January is a massive month and he's got the experience of working in the deadline scenario, so it's a great choice." Andrew Tunnah: Big mistake to let Pardew go. Has done a great job under the circumstances and knows the club inside out! Gregory Mandapat: Has any Newcastle manager since Kevin Keegan done well at St. James? The job is a poisoned chalice with the lofty expectations. jerry elumeze: Pardew to Palace doesn't make sense. Can't see the motivation football wise or money wise. McClaren to St James' Park? "It will be interesting because of the constraints of the transfer policy at Newcastle. This is a club where you are not going to be paid x amount of money to go there. It will be bonus based. Because of the way (club owner) Mike Ashley operates there is concern. Pardew is not liked by a lot of supporters but they need to be careful what they wish for. They are in a decent position now. Someone I know who is highly-rated at St James' Park is Steve McClaren but would he leave a good club in Derby, who are in a good position, and the security that is there for Newcastle?" Swansea manager Garry Monk, speaking to Sky Sports: "We were unlucky to lose here in the cup. We're full of confidence, we've had a good season so far and our performance levels have been good. If we can reach those same levels then we can put Liverpool under pressure and get a result. "Liverpool are still a very powerful team and a big club but we'll look to impose ourselves on them." told to "wise up" by manager Garry Monk, who says he will not tolerate the 22-year-old's "laziness" any more. The ex-Liverpool player was substituted after an hour of the 1-0 win over Aston Villa on Boxing Day following his seventh yellow card of the season. Monk said: "Jonjo has to wise up because that yellow card came from laziness and he has to be better than that." Shelvey left Liverpool for Swansea in a £5m move in 2013 and has been a first-team regular during his time at Liberty Stadium. He starts this evening. "You always know that in football anything can happen but this is not a real surprise. Alan Pardew has links at Palace and has been under pressure at Newcastle. Maybe it is just the right time for him to leave Newcastle and let them get on with their business." You can listen to BBC Radio 5 live now by clicking on the Live coverage tab at the top of the page. There is also action in the Championship this evening where an improving Fulham entertain managerless Brighton. The Cottagers have only lost once in their last seven home Championship matches while Brighton have won only once in their last 16 matches in all competitions. In League One, Barnsley v Oldham was a casualty to the weather but the league's bottom club Yeovil are in action against fellow strugglers Leyton Orient. We will keep you in touch with what is going on at these matches throughout the evening. So why would Alan Pardew leave Newcastle for Crystal Palace? He has strong links with Palace having spent four years playing in their midfield from 1987. Eagles beat Liverpool 4-3 after extra-time in a 1990 FA Cup semi-final and played in the final and the subsequent replay as Manchester United won 1-0. It is also fair to say he has been on the receiving end of a fair bit of stick during his time in the north east. QPR defender Rio Ferdinand on Twitter: "The management merry go round is about to get into motion it seems!!" "No deal done yet but seems inevitable Pardew for Palace. I know Steve McClaren highly regarded by #NUFC, their choice will be interesting." said: "Interesting managerial developments on the horizon. Some may think it is strange for Alan Pardew to want to leave a huge club for a smaller one but the scar left by months of abuse will never heal. Plus, the lure of going back to the club closest to your heart can never be underestimated." Simon Mignolet's "indefinite" spell out of the Liverpool goal is brought to an enforced end because of a thigh injury Brad Jones picked up in the 1-0 Boxing Day win over Burnley. The Reds also drop Steven Gerrard to the bench, along with fellow midfielder Lazar Markovic and defender Kolo Toure. In come Emre Can, Javi Manquillo and Alberto Moreno. Swansea winger Jefferson Montero has been ruled out for a month with a hamstring injury he suffered in the 1-0 win over Aston Villa three days ago. Defender Angel Rangel and midfielder Ki Sung-yueng drop to the bench. The players coming in to the Swans line-up are Jazz Richards, Leon Britton and Nathan Dyer. With the clubs in talks, we want to know whether you think Alan Pardew should leave Newcastle for Crystal Palace? Before we get into tonight's match too deeply though, let's take a look at Crystal Palace's managerial search - after they sacked Neil Warnock on Saturday. avoiding commenting on reports he could be heading back to London has done little to quell the speculation. Newcastle Chronicle this evening that his departure is all but done and dusted. Liverpool XI: Mignolet, Can, Skrtel, Sakho, Manquillo, Moreno, Lucas, Henderson, Lallana, Coutinho, Sterling. Swansea XI: Fabianski, Richards, Fernandez, Williams (C), Taylor, Britton, Shelvey, Dyer, Sigurdsson, Routledge, Bony. There is plenty of sport for you to stay across this evening, starting with the Monday Night Club hosted by Mark Chapman on BBC Radio 5 live now. Former Wigan and Republic of Ireland midfielder Kevin Kilbane will join Chappers with all the build-up to tonight's match plus the latest in Crystal Palace's managerial search. That will be followed by live radio commentary of Liverpool v Swansea, which you can also listen to while following this text commentary by clicking on the Live tab at the top of the page. Good evening and welcome to the final Premier League match of 2014. We will bring you live text commentary of Liverpool's home match against Swansea from 20:00, with the Welshmen three points and two places ahead of their hosts in the table. Swansea have never won a league match at Anfield - drawing three and losing 10. A win wouldn't be a bad way to sign out of 2014 would it Swans fans? First though, Alan Pardew to Crystal Palace? Hope, belief, misery, frustration - four words that could sum up Liverpool's 2014. Five months of exceeding anyone's expectations followed by the final five months of the year that have flattered to deceive for the Reds. Now, with the curtain coming down on the Premier League's calendar year, can Brendan Rodgers's men end it with back-to-back wins. We go again?